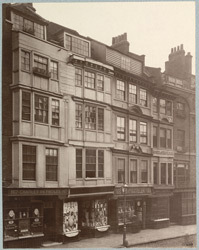 "These houses are on the south side of the Strand, almost opposite to the Church of St. Mary-le-Strand...These houses were no doubt built before 1666, the date of the Fire, some details having been added in the early part of the 18th century." Regulations prohibiting the building of timber houses were introduced after the Great Fire.